The view is truly the focal point of this home, and it can be enjoyed all over the villa! The pool seems to hang over the hillside, with nothing obstructing the ocean vista. On top of that, there’s an observation deck above the pool with binoculars, and every window in the main area opens completely to the sea. To top it all off, the beach is only 3 minutes away! Nid d’Amour is a fully air-conditioned, two-bedroom villa on the hillside over Baie Rouge. With a view that stretches across the ocean, this private hideaway is perfect for a family vacation or two couples who want to travel together. A unique water feature above the pool frames the view, with regal columns lining the edge of the pool and a waterfall trickling down from the center. There’s also a built-in wading area and a Jacuzzi, so guests of all ages can enjoy the pool. The terrace features several seating and dining nooks that all face the view. Dine al fresco on the observation deck above the pool terrace and watch the waves crash below. Inside, the living room has comfortable furniture, a large plasma TV, DVD player, ceiling fan, and partial screens. Guests can dine in the spacious, fully-equipped kitchen or in a glass conservatory off to the side. Both bedrooms feature king-sized beds, ensuite bathrooms with showers, ceiling fans, and exterior access. Each room also has a plasma TV, DVD player, and satellite. 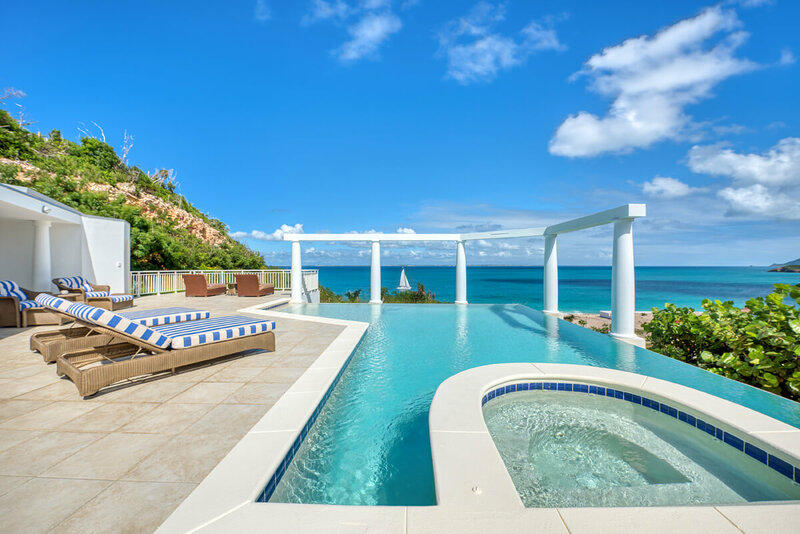 One of the showers opens to the view of Anguilla, and both suites face the sea. Nid d’Amour is less than 3 minutes from Baie Rouge Beach and fine dining. Marigot, the French capital, offers restaurants, shops, galleries, historic buildings, and the Creole Market. 2 min. drive to Baie Rouge, 5 min. to Cupecoy.